Whether you are doing story time in a library or preschool or are looking for great STEM titles to use in an early childhood curriculum, this is a wonderful story about a hardworking bird who is getting her nest ready for her eggs using that all powerful tool known to birds ,...the tool of FORCE. 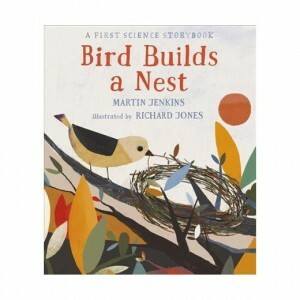 Yes, we're teaching physics to the little ones by showing them what a bird can do when she has FORCE in her toolkit. Using those oversized images we all love to use in our story times, we follow a bird as she wakes up on a day with a big job ahead of her. First, she needs her breakfast so she heads out looking for a nice, juice worm and with the dramatic turn of a page, she finds just the one and gives it a tug. Now, if you paid close attention back on page 2, you know that FORCE is something that "changes an objects motion. It can make an object stop or start moving, move faster or slower, or change direction." Our lovely bird is going to demonstrate the use of FORCE by pushing and pulling her worm and later some twigs as she goes about using FORCE to build her nest. Nature has a starring role here and some truly delightful eggs appear in the nest of engineered twigs. This lovely, highly-educational story comes to its happy close with an invitation to think about "Pushing and Pulling," and an important index that encourages young readers to go back to specific pages to think more deeply about specific forces and how they appeared as our bird went about her day. Charming, smart and a perfect title to introduce STEAM into your STEM story time especially as spring arrives.